It’s been a slow start for the Oculus Rift. Years after Palmer Luckey piqued the interest of the tech world with his crowdfunded pitch, and just shy of a year after its consumer launch, the virtual reality pin-up device has yet to break into the mainstream. While neither HTC with the Vive nor Oculus owners Facebook are disclosing exact sales numbers, Sony announced bullishly last month that it is approaching the million sales mark for its PlayStation VR headset. Extrapolating from market factors and developer whisperings, analysts are now stating that Sony could be outselling rival Rift and Vive devices by as many as three to one. Palmer Luckey’s personal political dealings likely didn’t help the brand’s image either – especially within the inclusive, neutral environment of its Facebook overlords. It’s of course a long-term play by Facebook and its VR rivals. For Facebook, the belief has always been that VR will be a slow burner, seeping into public consciousness slowly before eventually becoming an ubiquitous way to not only game, but to communicate within virtual spaces, too. It would be enough to make you hold fire on picking up an Oculus Rift headset. But if the first year of sale saw developers working with their training wheels still on, a recent showcase of the second wave of Oculus Rift titles suggests that, not only are things kicking up a gear, but that its platform will be the only destination for the most exciting gaming experiences this year. It may sound histrionic, but the latest wave of Oculus Rift titles currently being demoed to press are among the most impressive system showcases that we’ve ever seen. If a pricey peripheral like a virtual reality headset needs “system seller” titles in the same way that a games console does, then Oculus has them lining up, waiting to pounce from the wings. Before discussing the games themselves, it’s worth noting that it’s the recently-released Oculus Touch controllers that are making the most revelatory changes to these experiences. We’ll spare the details by pointing you to our full review, but it can’t be underestimated what a difference these make to the Oculus package compared to the year one release – they give such an intuitive range of motion and in-game dexterity to essentially bring the learning curve of most games down to mere moments rather than lengthy tutorials. And they’re surprisingly versatile too – while HTC’s chunky Vive controllers have necessitated the development of new Vive trackers for peripherals, the Oculus Touch controllers are discrete enough to be paired with peripherals directly. Oculus Rift’s Rock Band VR, for instance works simply by attaching one of the Touch controllers onto the plastic guitar’s headstocks – from there the room-scale camera trackers do the rest of the work, and you 100% feel like there’s an actual guitar in your hands within the game. A quick nod to the drummer sat on the riser behind you, and suddenly, thrillingly, you’re rocking a stage in front of a crowd of hundreds. Short of starting your own band, VR Rock Band is the real thing without the inter-band politics and dodgy promoters to contend with. The variety of new games heading to the Rift thanks to these controllers is immense, and though the overall majority skews towards FPS games, each is doing unique, jaw-dropping things that wouldn’t feel possible elsewhere. Perhaps the most impressive title on show at the Oculus press preview was Lone Echo, a first person, space-based VR game that is one part Gravity and one part I, Robot. There’s a grand space mystery conceit at play, but the most breathtaking aspect of the game was the way it delivered a zero-gravity environment. Playing the part of a human-sized robot, you’d need to propel yourself around a space station by gripping surfaces and pulling away – just as you see real world astronauts doing up on the ISS. The fidelity of motion and refresh rate of the visuals allowed this to happen without turning your stomach, and the way the Touch controllers mapped individual finger grips was fantastic. The sense that you were literally hanging onto the outside edge of a spaceship as an interstellar anomaly violently rocks the space around you is a memory that will not be quickly forgotten. From Ready at Dawn, the dev team behind PS4 exclusive The Order: 1886, the environments and digital actors involved are incredibly lifelike too (and unlike that earlier title, there’s the promise of a lengthy single player and deep multiplayer component too). To try Lone Echo is to instantly put it at the top of your most-wanted list. While its setting may not be quite as innovative, From Other Suns is solving a major VR problem with great skill. Borderlands meets cult-TV show Firefly, you’ll have a huge galaxy to explore from the comfort of your own spaceship, conducting ship-to-ship boarding runs in first person, as well as fending off alien raiders heading to your ship. The touch controllers allow you to point a weapon just like an arcade lightgun, giving you great accuracy, while room-scale VR lets you duck and take cover intuitively in real space. However, it’s how devs Gunfire Games are dealing with the difficult question of allowing a player to move great distances that’s the game’s greatest innovation. Currently, VR games that allow for a degree of exploration offer one of two control methods – either you let a player loose with a full range of movement, as you’d find in a shooter like Call of Duty, or you have them point at a place they wish to go and let them teleport to that location. The first method runs the risk of making the player sick as the brain struggles to comprehend the false movement its eyes are registering, while the second doesn’t allow for fine control and is less immersive. From Other Suns finds a halfway home between the two. Pushing forwards on the Oculus Touch’s control stick sees your player avatar spring forth from your VR “body” and into the space in front of you – like an out of body experience, but one you have control over. From this third person perspective, you then position the avatar where you’d like them to be as you would in a game like Tomb Raider or GTA, and then once the stick is released, snap back into that first person view. It’s surprisingly intuitive, and very elegant, giving the player agency over movement at all times without running the risk of making them feel ill. It’s the way I’d now hope to see an open-world VR game work. Other titles are innovating in smaller, but equally fun ways. 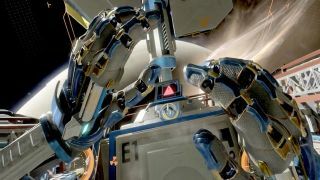 Robo Recall is exhilarating fun, taking full advantage of the technology to deliver one of the most immersive, high-octane shooting galleries we’ve yet experienced, while Brass Tactics (with a dev team that includes Age of Empires veterans) takes the real-time strategy genre, and perfectly translates it into a tabletop war game that you can hover over. It was like playing the clockwork opening of Game of Thrones, as some sort of omniscient disembodied general. Co-operative horror shooter Killing Floor: Incursion brought the biggest laughs – with a chum running around its blood soaked halls with me, the demo devolved (against the dev’s will) into a darkly humorous game of tennis, using lopped-off zombie arms and heads as a bat and ball. It was a moment that totally dashed the fear that VR would have to be an isolating social experience, as my partner and I laughed manically, creeping up behind each other with gory zombie heads floating in Touch controller hands, ready to "hand deliver" a personalised jump scare. Virtual reality is currently in the eye of a storm – the promise of the tech is there, but the buy-in price for consumers is high, and a small install base is a difficult sell with which to get developers onboard. But if Oculus Rift can weather this storm, the experiences it’s now ready to deliver are undeniably exciting. It’d be devastating to see the VR dream fall through just at this junction where it feels as if it’s reaching a point of maturity.